I grew up by the ocean. I have always felt a magnetic force to it. Especially salt water. As a child, my mother always had to dress me up in a lifejacket before I went outside the house. The ocean was my playground. It still is. I still act like a child when I’m by it. To be honest, most of my sparetime goes to this amusement. Back to when I was younger, my friends and I always hung out by the waterside. We were fishing a lot of crabs, of course, but also fish like eel and whiting. After a few years, someone told me about the sea trout. The silver of the ocean. A fantastic fish ,that apparently, was going to be a difficult catch. Now that I am older, the hunt for sea trouts comes regularly. And it shows ,that in 9 out of 10 occasions, it is everything but difficult. The seatrout actually sacrifices quite easily. Knowing this, I always bring my kids for seatrout fishing. They catch them almost every time. I usually do my fishing in Oslofjorden or Västkusten in Sweden. Nothing is better than bringing the kids or some friends there, put up a fire, and cook in natural surroundings. We always make sure to be ready when the wind lowers and the sea trout shows up on the blank surface. When we hopefully catch «the silver of the ocean» during sunset. It has to be experienced! That is what its all about.Just amazing. I’m quite easy when I fly fish. I usually bring a box with simple dubbing shrimps, a couple of fish imitations and some worms (polychaete’s). And of course scud patterns. You can’t forget those! Mostly, I use my LPXE 9’#5, coastal slow int #5 and a Haze v2, which really works out great! When the time is good, and the scud swarm on shallow water, I usually use a #3 and a floating line. To be able to slink on a mirror blank water and cast after big seatrouts…that is very exiting. The previous season’s peak , was when I brought a younger family member out fishing. He knew I had been going several days in a row, catching many sea trouts weighing between 1 and 2 kilos. I guided him to the spots where the sea trout seemed to be. Rigged his rod. One cast. BAM! He caught that fish like a pro! He also quadrupled his personal record! 2,1 delicious kilos. 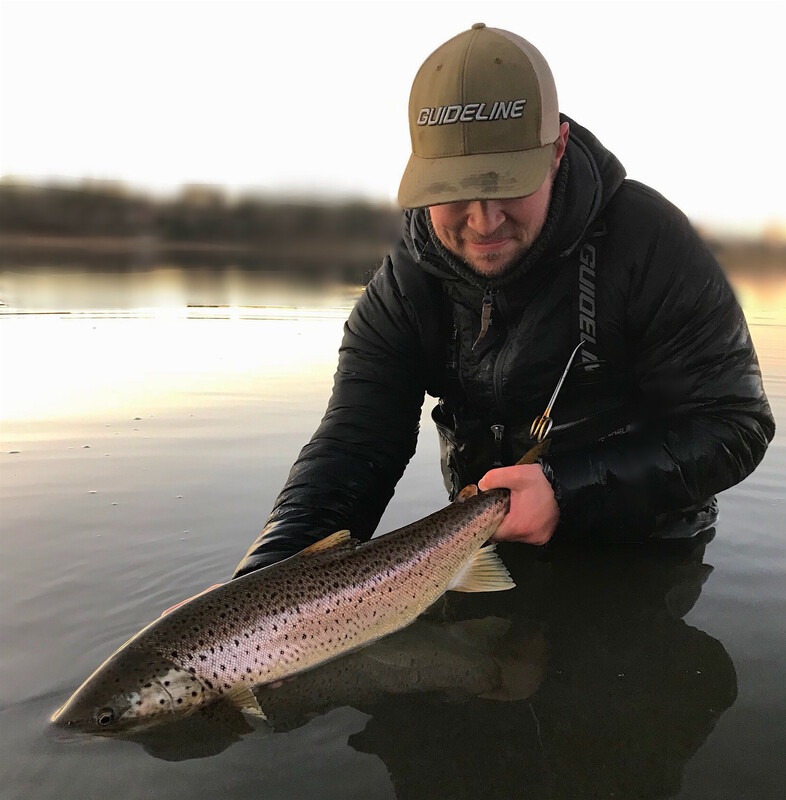 Sea trout fishing can definitely be that easy!… When you just get a little bit into its patterns and where it searches for food, you will catch them. Tight lines 😊🎣 Marius .